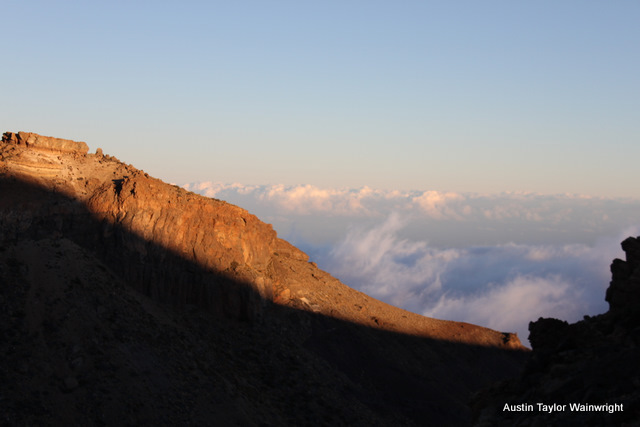 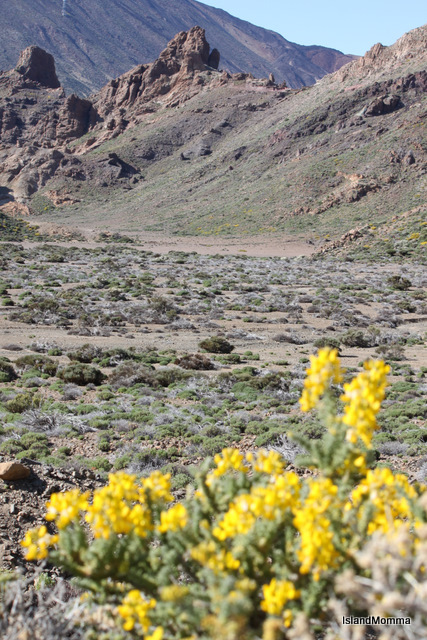 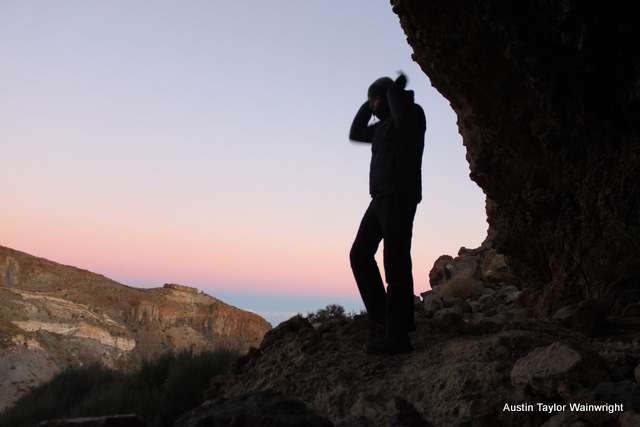 When a Winter day in the Canary Islands is good, it is nothing short of dazzling. 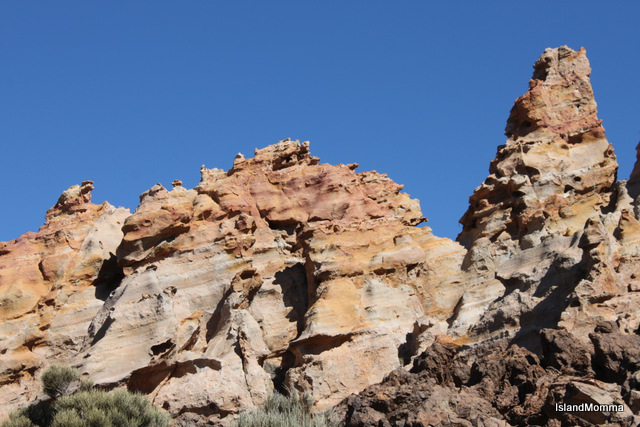 The air is so unbelievably crystal-clear and the colors so vibrant that you might be excused for thinking you’re on the set of some technicolor movie. 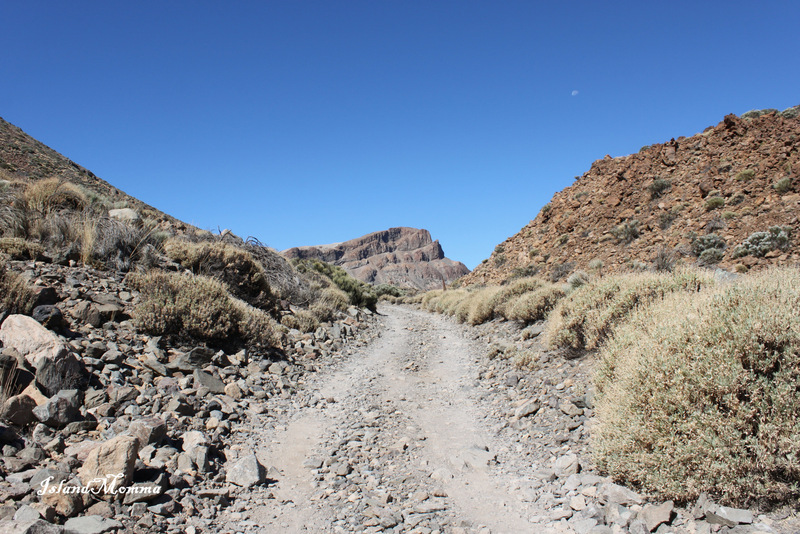 We had a day almost like that for a short hike on Thursday. 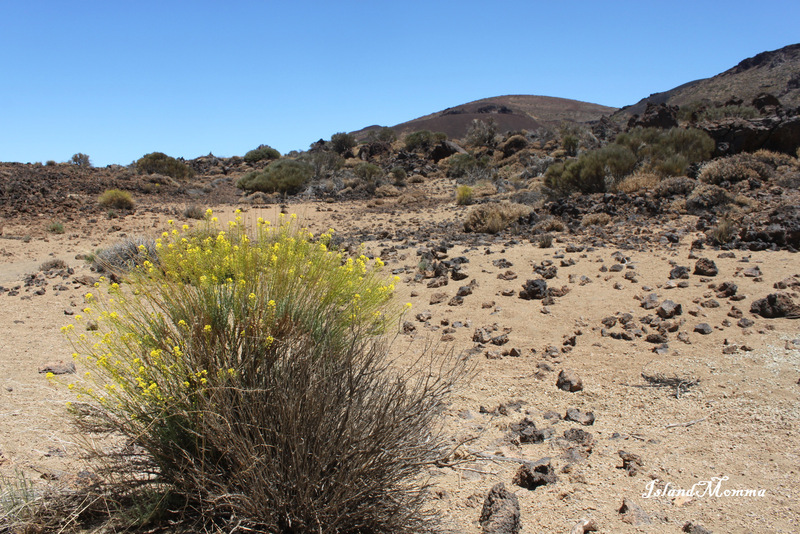 The temperatures were warm, but not hot, the sun shone and the skies were blue. 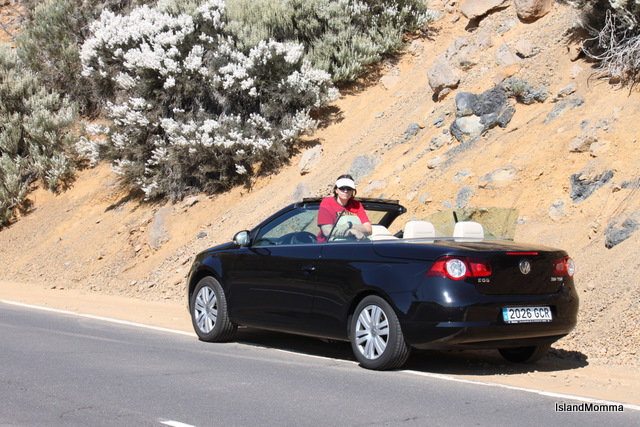 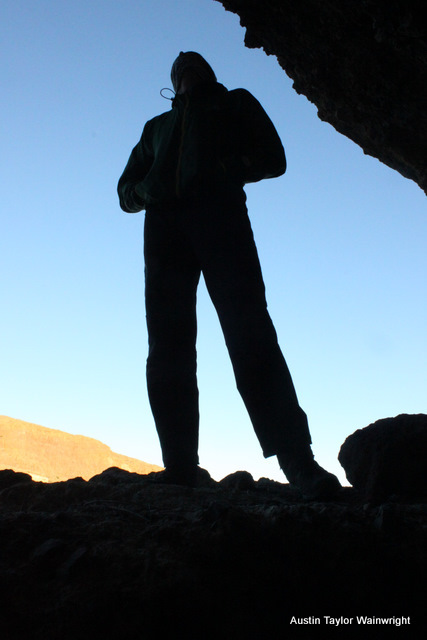 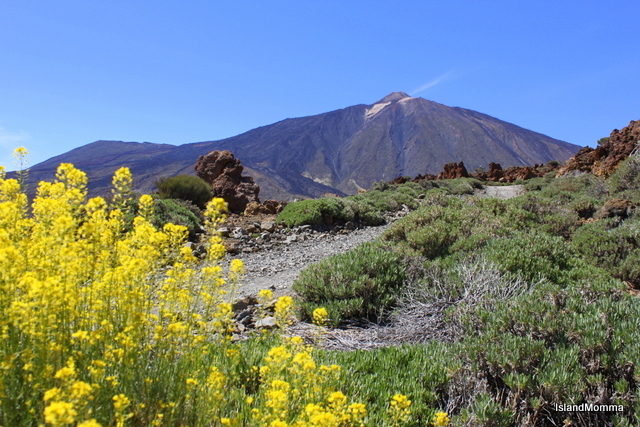 The only complaint was the calima which made the views less than perfect…….and it seems really picky to complain! 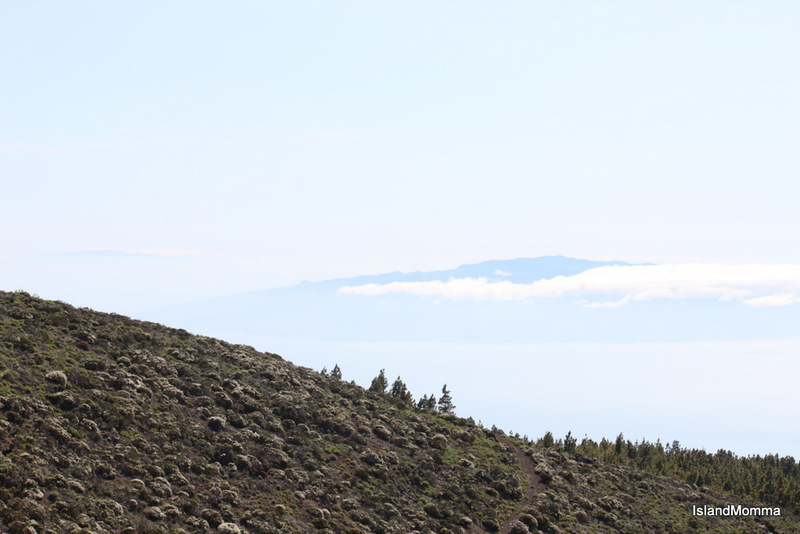 As we twisted our way up to the National Park from Arona the mountains shimmered in the haze, and as we rose higher the ocean became a kind of whitish blur below us, and finally became invisible. 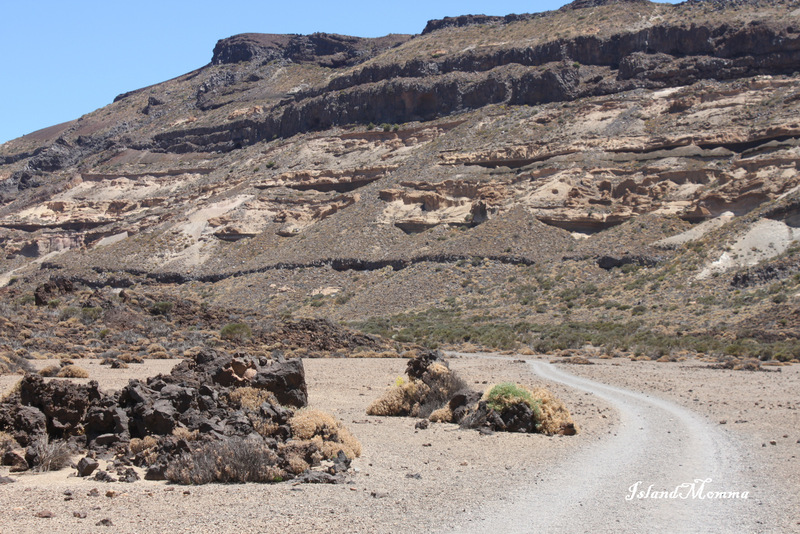 Calima is the suspension in the air of Saharan sand and dust, blown across that stretch of the Atlantic which separates these islands from Africa. 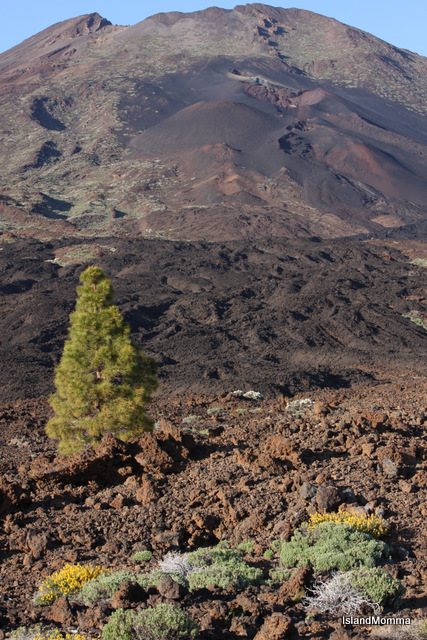 The culture here is so very European that if it weren’t for this reminder from time to time we might forget that geographically we have far more in common with that continent than with Europe. 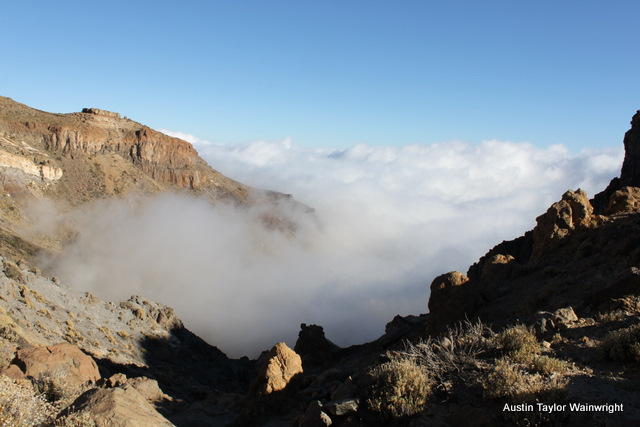 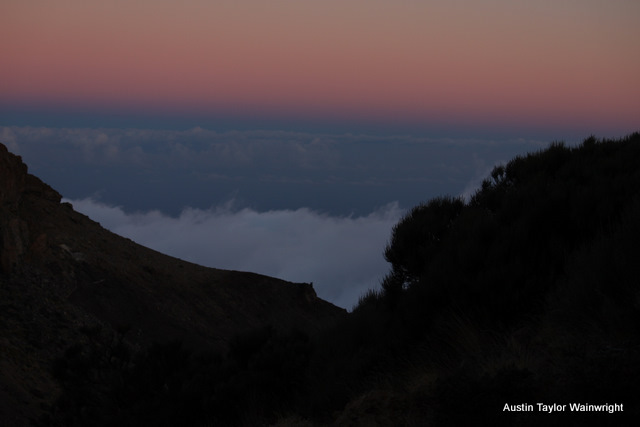 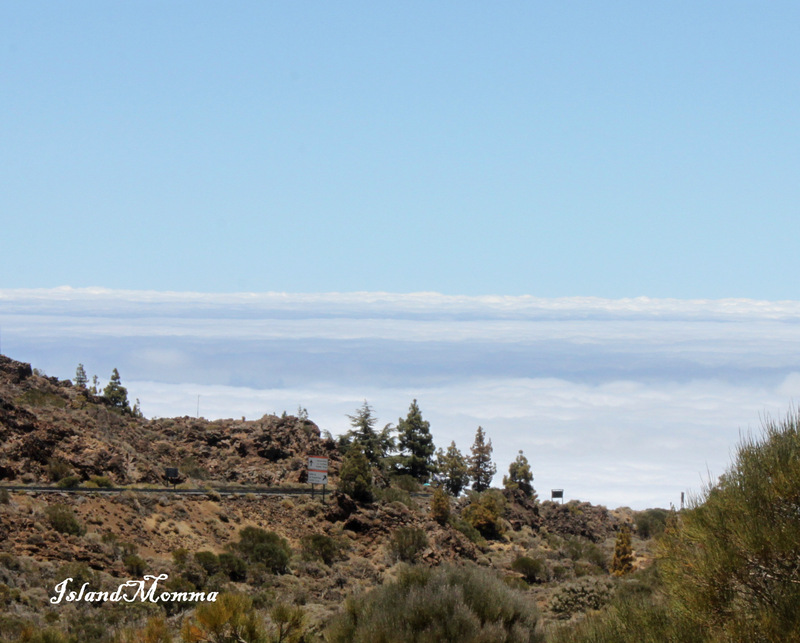 Sometimes the calima’s effect is the same as low cloud, blocking the sun and giving life a gloomier backdrop than usual, but this day it wasn’t so intense. 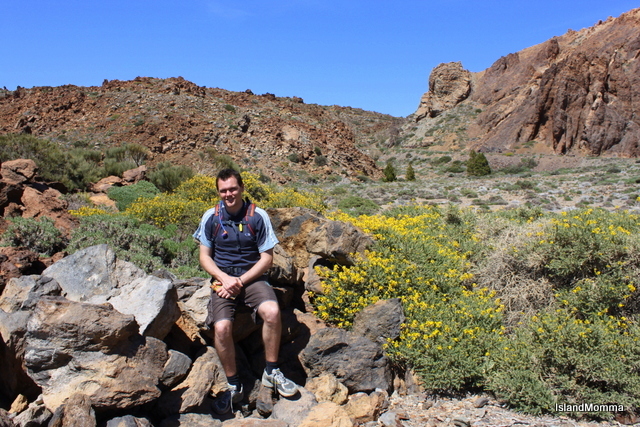 When we stopped for coffee in Vilaflor, even at 10am, the sun was warm and bright, and it was hard to believe that this is Spain’s highest village, something that never fails to amaze me in Winter. 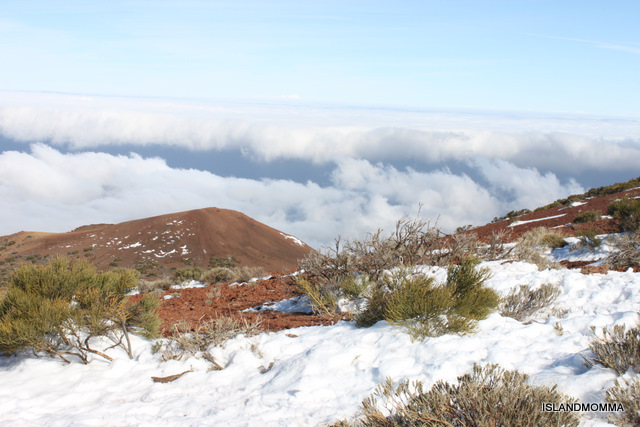 Sitting there at a Coca Cola- red, plastic table and remembering similar chairs and tables in the ski resorts of the Sierra Nevada, it was hard to take in that I was higher here than there. 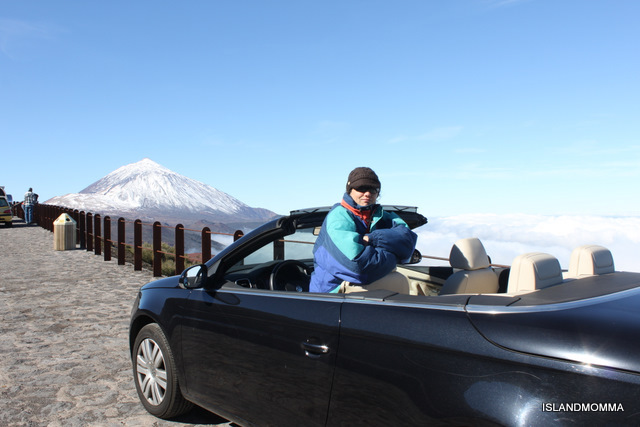 Instead of driving into the caldera, we turned left and took the road which eventually leads down to Chio and the west coast. 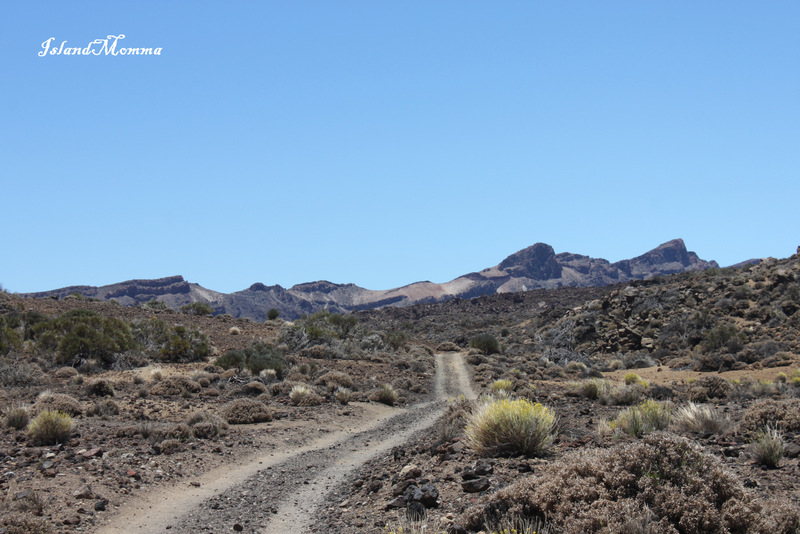 It’s a bleak stretch of road at times, depending on the weather and time of day, but Thursday morning the stark badlands to our right, with distinct, ancient lava flows and little vegetation contrasted with the intense sapphire of the sky, and seemed warmer than I remembered. 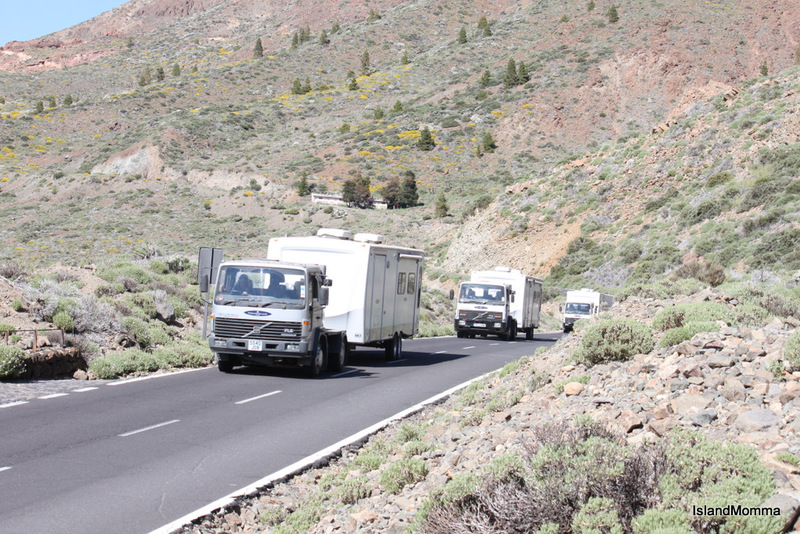 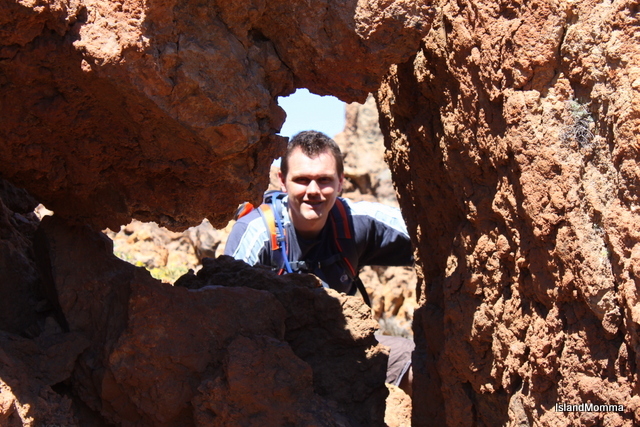 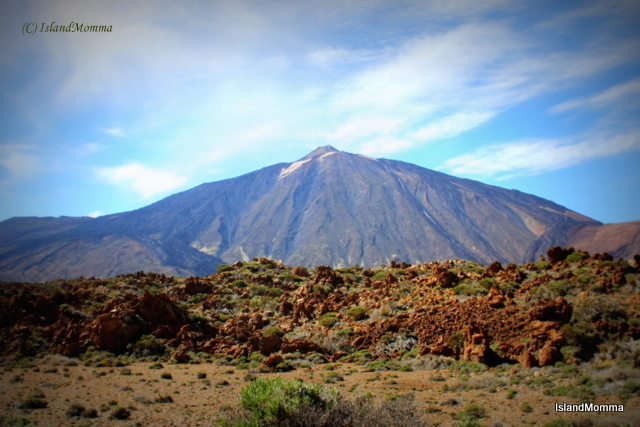 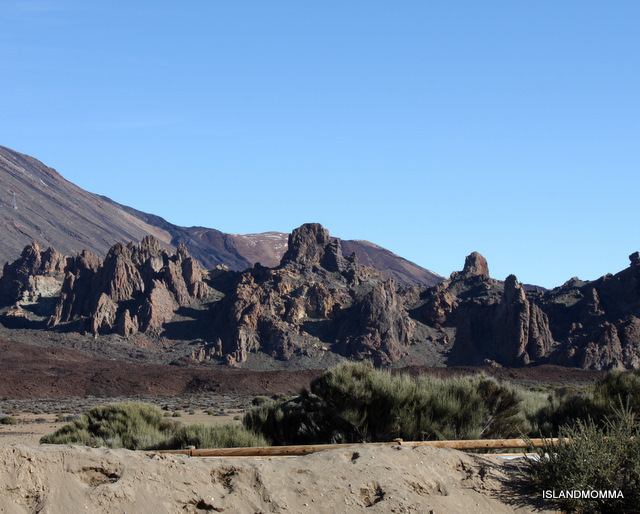 We were heading, however, away from Tenerife’s most famous volcano in the direction of its youngest, Chinyero. 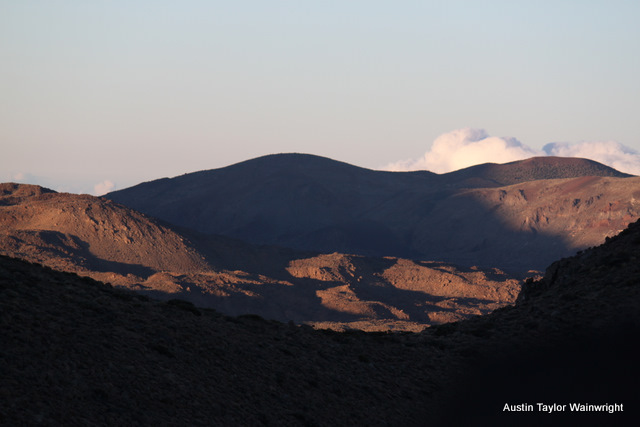 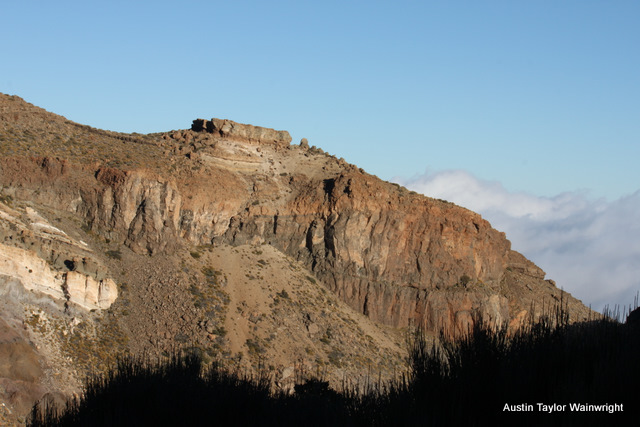 Chinyero last erupted a mere 103 years ago, in 1909, Cristina remarked that her grandmother had remembered the event, and I was struck by, often, how little we treasure the living links with history we have amongst family and friends. 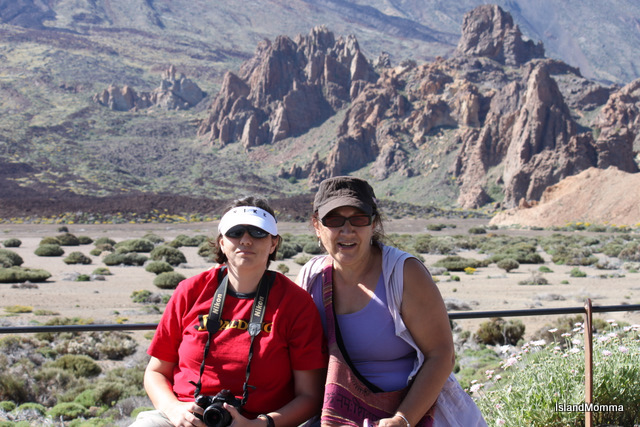 I love to hear Cristina’s own reminiscences about her childhood and insights from older generations. 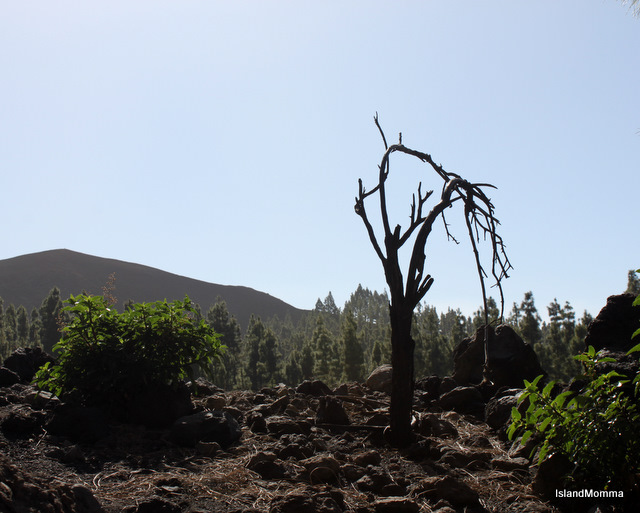 Life in the Canary Islands, under Franco, meant that progress we took for granted in western Europe and north America in the 50s and 60s didn’t happen here until later, with the effect that there are still folk living who are young enough to remember the much harsher kind of life which my long-dead grandparents used to talk of…….. but I digress (what’s new?!). 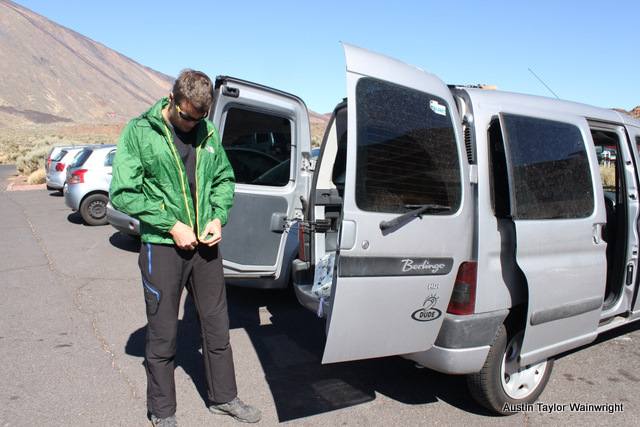 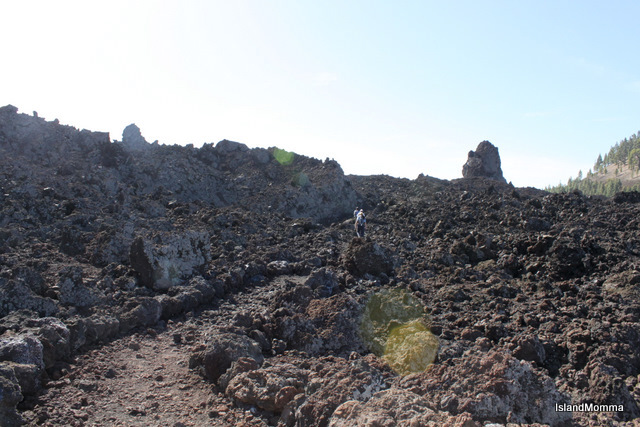 Pulling off the main road and leaving the car on a cleared space on the hard shoulder, we set off through sparse forest and barren lava fields. 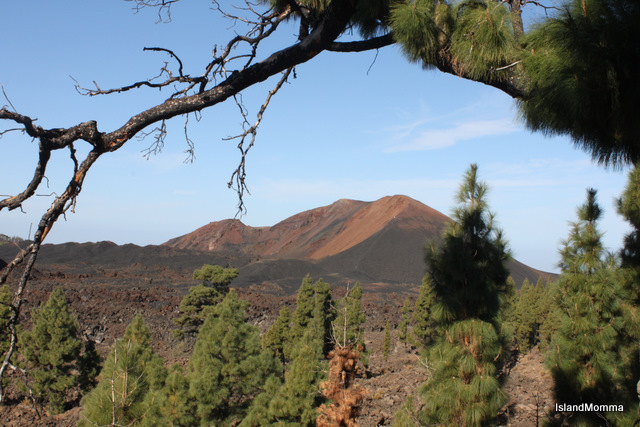 The forests of these slopes are pine, and almost exclusively Canary Pine, a hardy tree which can withstand the strong winds which whistle across the spaces between the island’s volcanoes, and which bring down the less stalwart species, which have been planted over the years to fill in deforested areas. 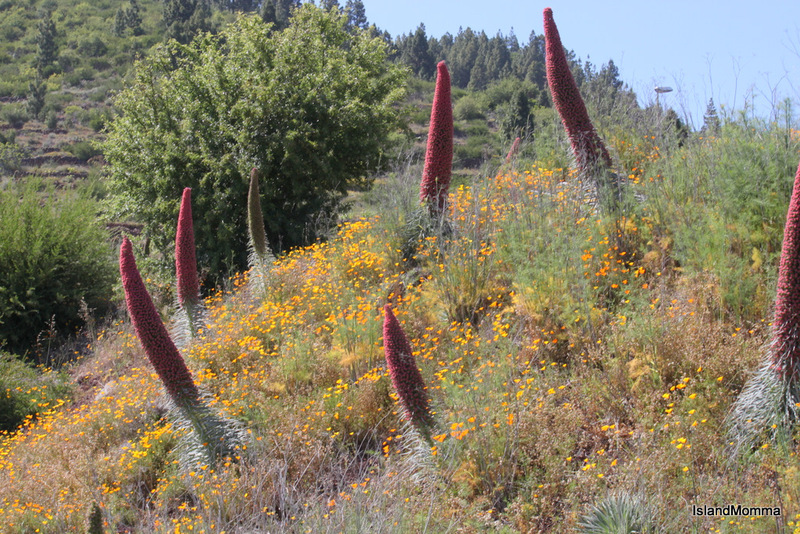 Their needles, long and graceful, collect the morning dew, channeling it to earth to seep through the porous rock and underground to feed hidden reservoirs. 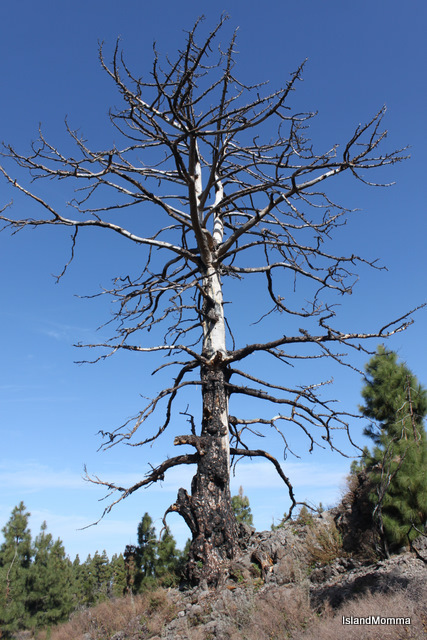 In this area almost all the trees we saw bore witness to the forest fires which raged there four years ago, their blackened trunks, left charcoal stains on your fingers when touched. 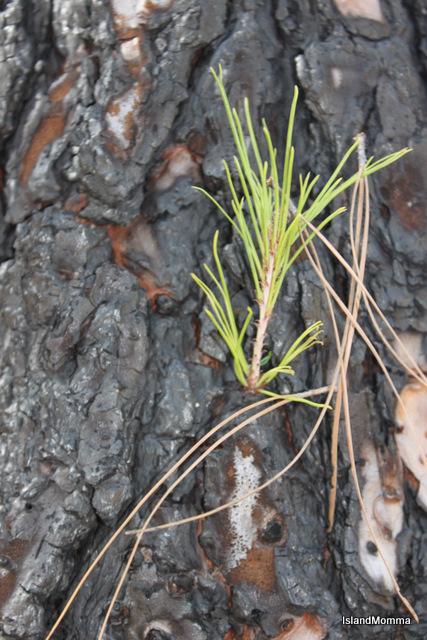 Canary Pines are almost totally fire-resistant, and new growth on the charred trunks signaled rebirth and life’s continuing cycle. 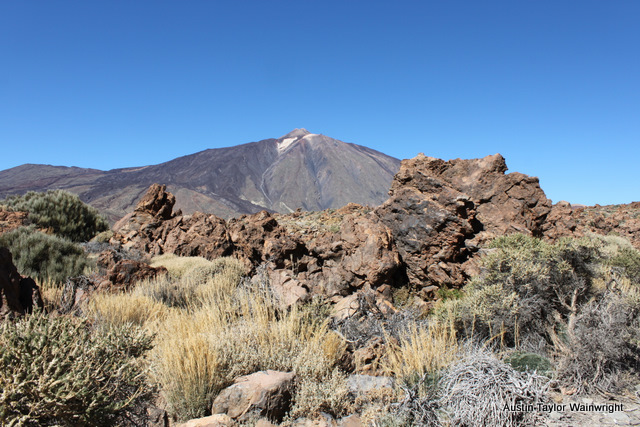 With Chinyero to our left and El Teide and Pico Viejo to our right, though veiled by the calima, there really was a sense of pre-history, as we emerged from the trees to pass through lava fields so bleak and desolate it wasn’t hard to imagine them steaming as they cooled down a hundred years ago. 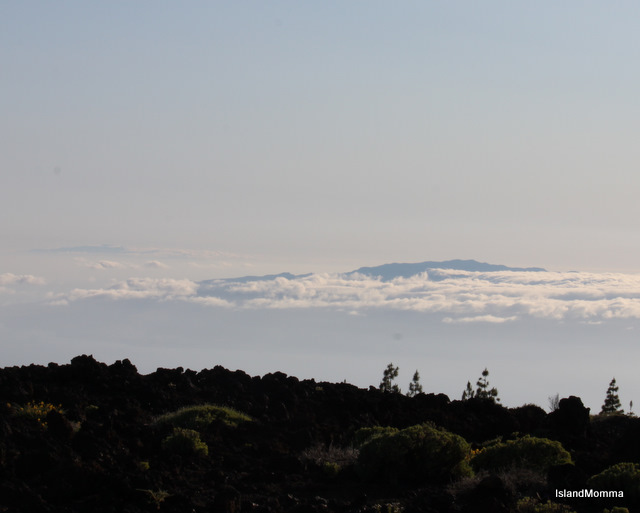 It most certainly was a landscape to inspire musings on the powerful forces of Nature. 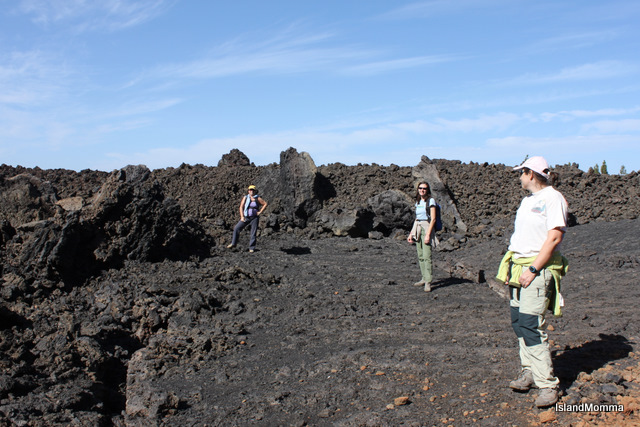 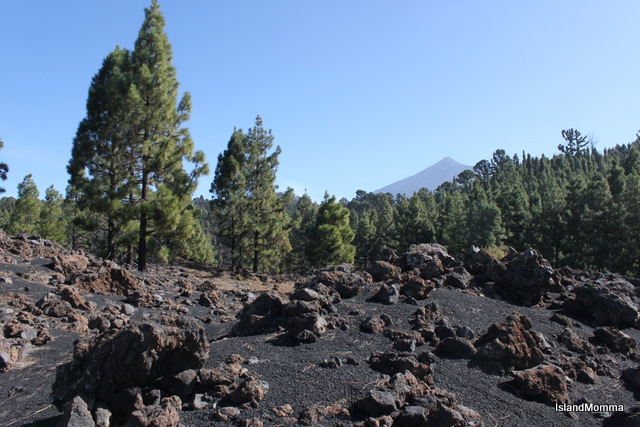 Between the reminders of raging forest fires and Nature’s ability to renew, and the stunning lava landscapes, from the fine, black sands to the huge boulders all spewed from earth’s mysterious interior, a walk here has the effect of putting you, as a puny human, in your place. 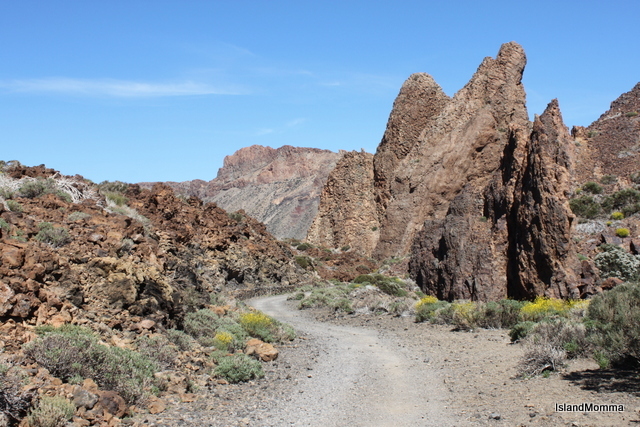 Rugged badlands of basalt opened up before us as we turned a corner. 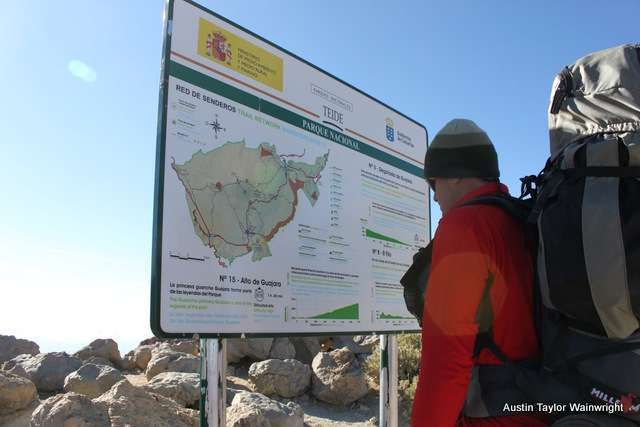 The route we had chosen was circular, and would bring us back to our starting point without having to retrace our steps. 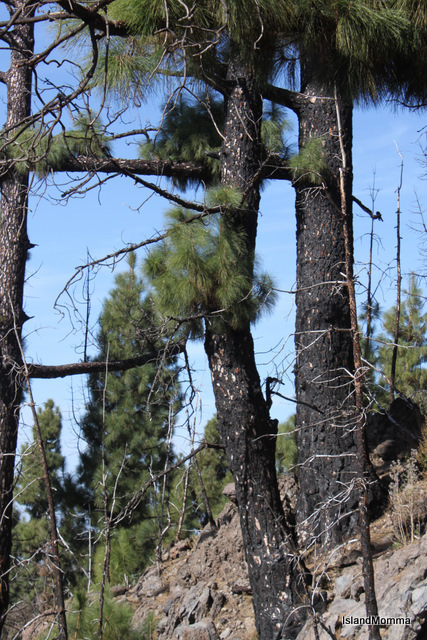 We passed from dark and arid landscape and back into forest, crisp with pine needles underfoot. 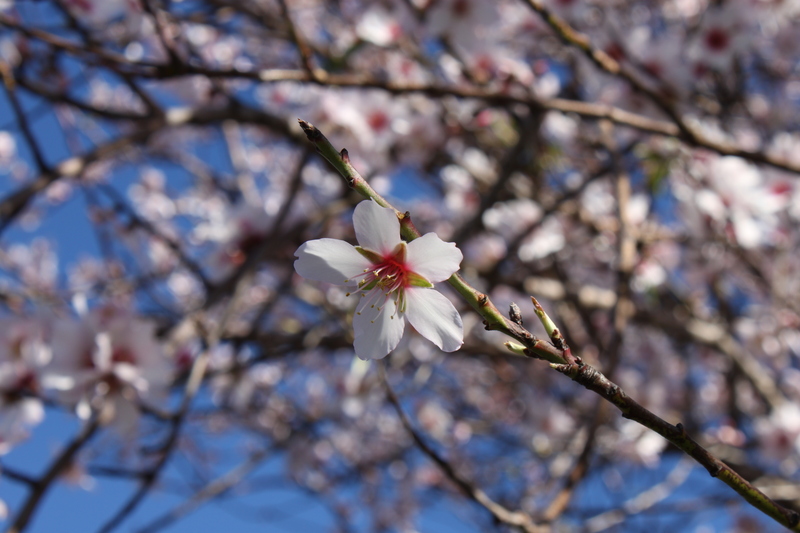 We haven’t had any rain to speak of this winter yet. 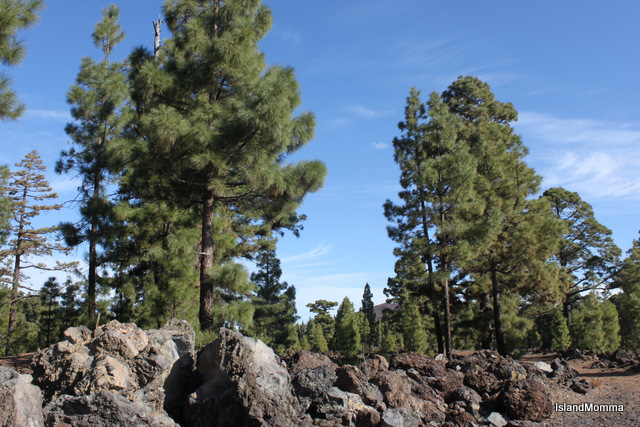 Canarian pine forests typically have little undergrowth, in contrast to the lusher forests of the Anaga Mountains with their bracken and moss. 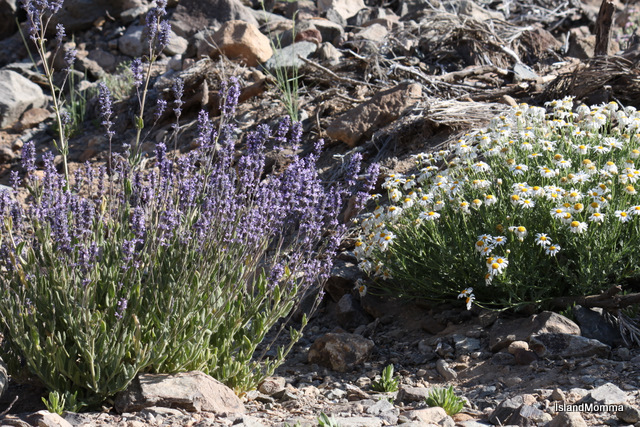 Here the undergrowth was dominated by pennyroyal, locally known as poleo, and widely used in infusions, despite its dubious reputation. 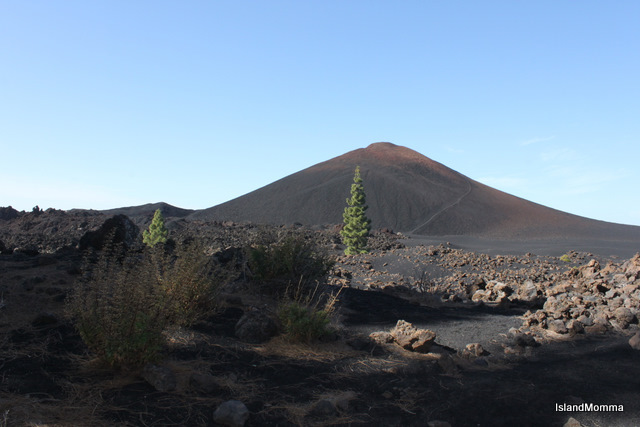 Since 1994 the area around the main volcanic cone of Chinyero has been a Protected Natural Reserve, and I was really happy to note that everyone going there seems to respect that, because we didn’t see one piece of litter of any kind. 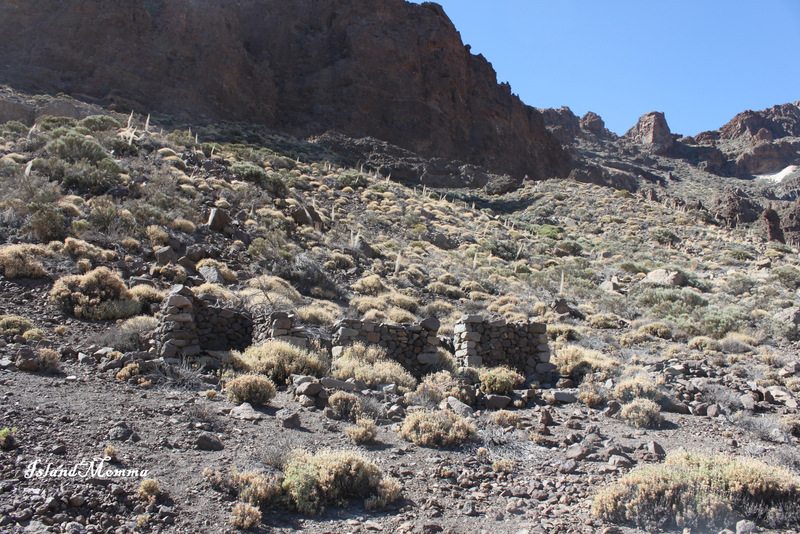 The paths are well laid out, and the signs, hmm, quite good, could be better, there were a couple of places where they were a tad confusing. 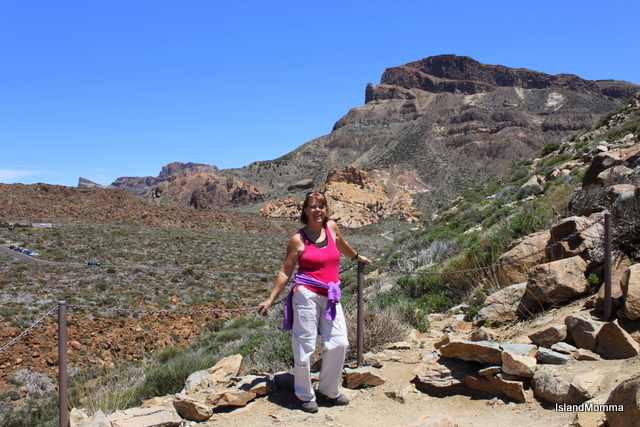 Pilar, the expert amongst us, had anticipated a two-hour walk, but with stops to admire views and take snaps it took us around three. 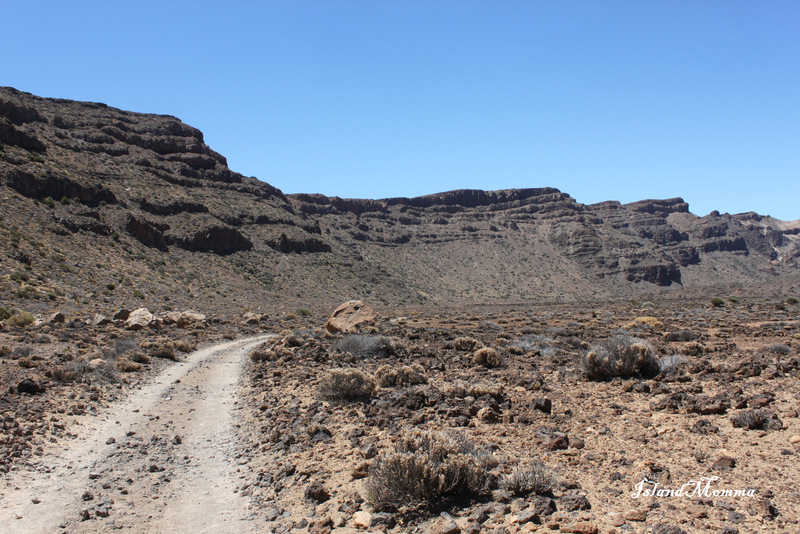 It was easy, not at all steep on the circular route, just a bit rocky underfoot at times, and although there are stretches which are quite exposed, it isn’t long before you’re under cover of trees again. 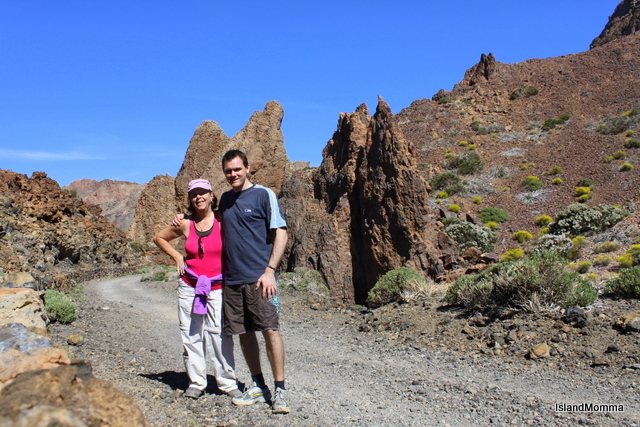 We passed other walkers, all either German or Italian, but we had moments of silence and solitude too. 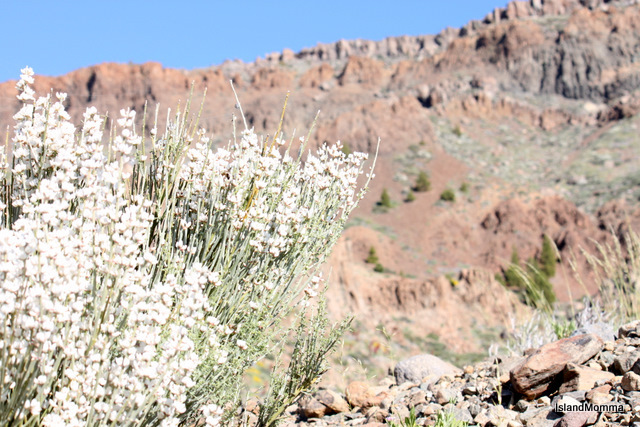 I never cease to be surprised at things I learn here, and on this day my learning curve came when Pilar observed that the bird call we could hear in the background as we picnicked at the end of our walk was a crow. 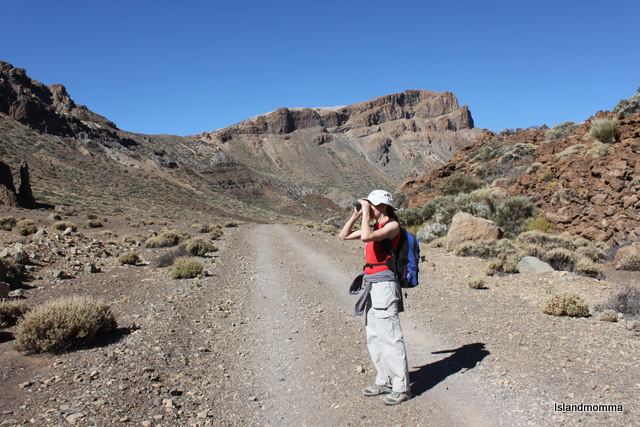 My surprise was that the sound was worth remarking on, but apparently there are very few on Tenerife, Pilar knew the statistic for the number of pairs breeding in the area. 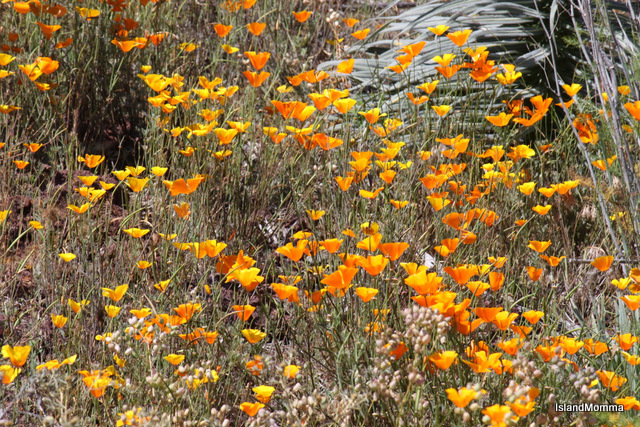 For me, even after living here for almost 25 years now, the sound was nothing out-of-the-ordinary, to the point where I even remember once going on a crow shoot in England, at the invitation of a farmer whose crops they were devastating. 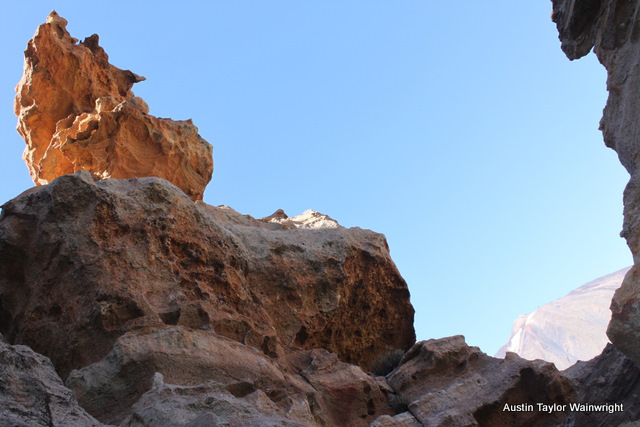 It’s surprising how another culture can seem so familiar and yet so different at the same time. 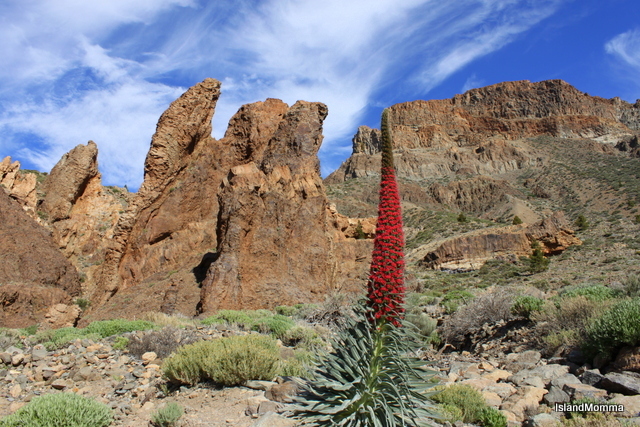 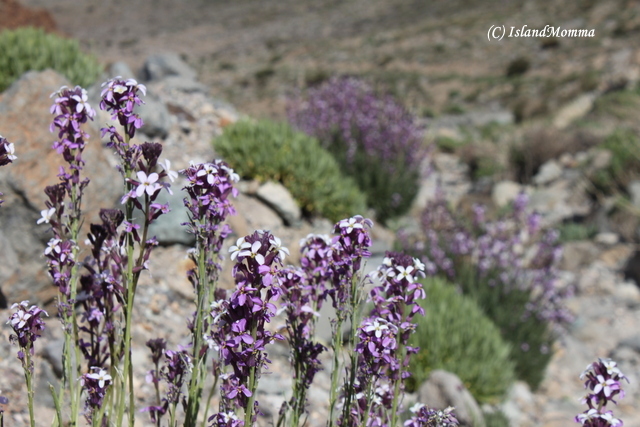 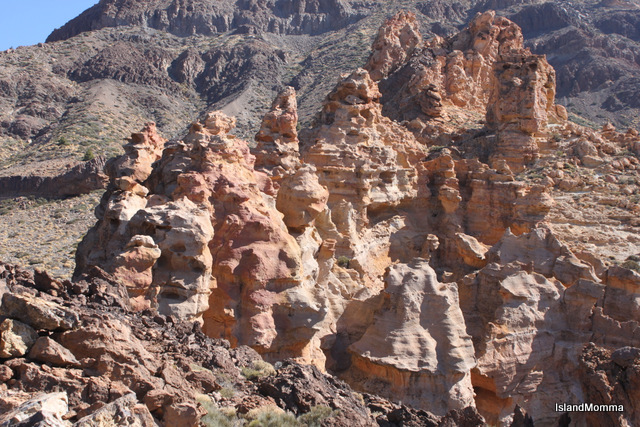 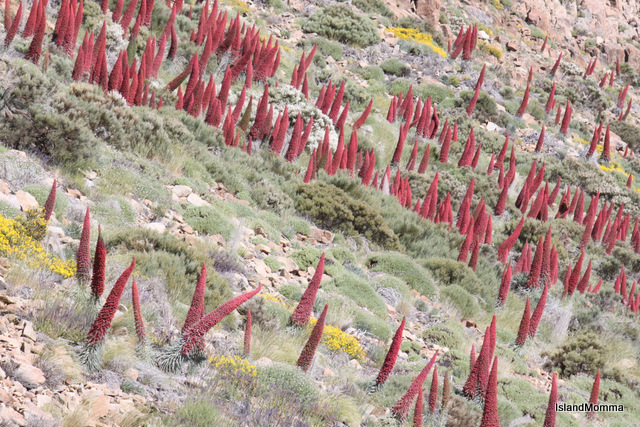 Categories: Canary Islands | Tags: calima, canary pine, chinyero, chinyero nature reserve. 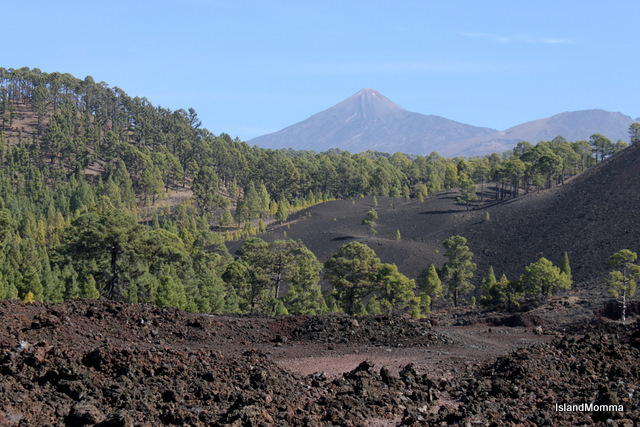 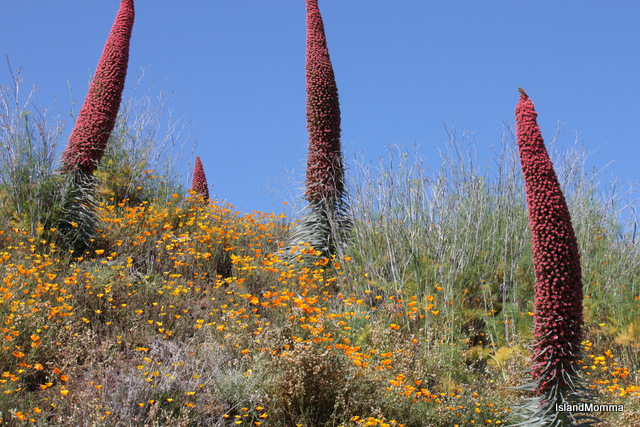 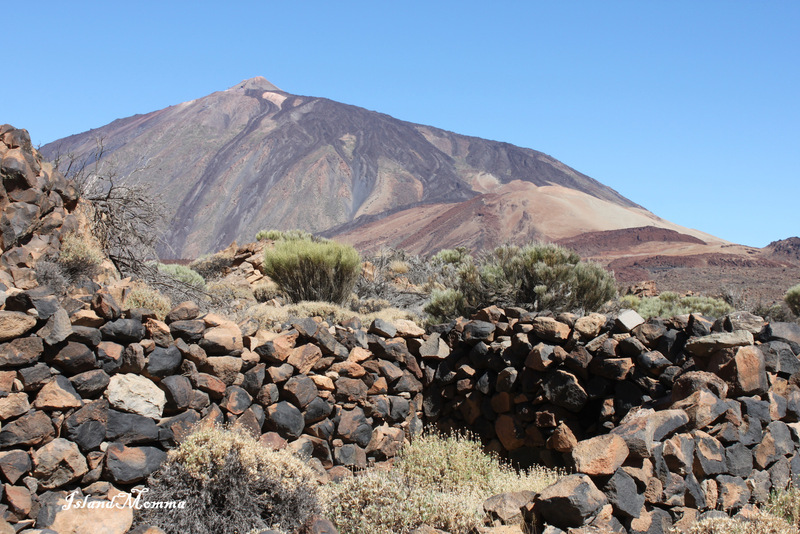 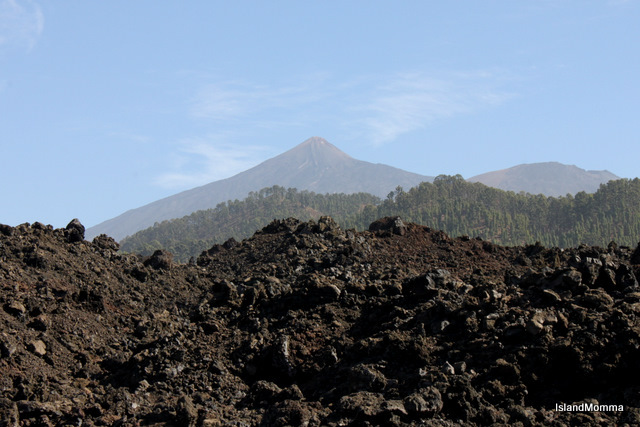 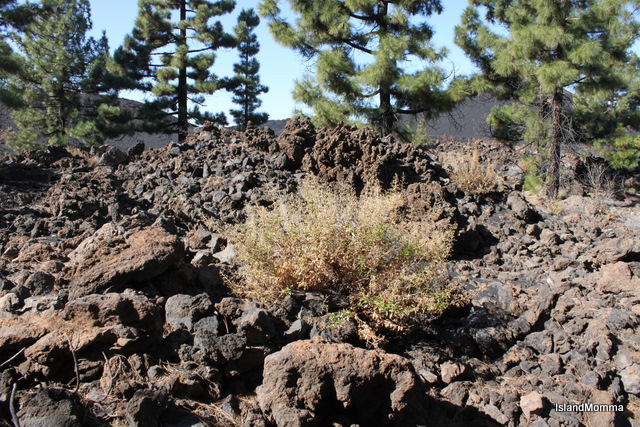 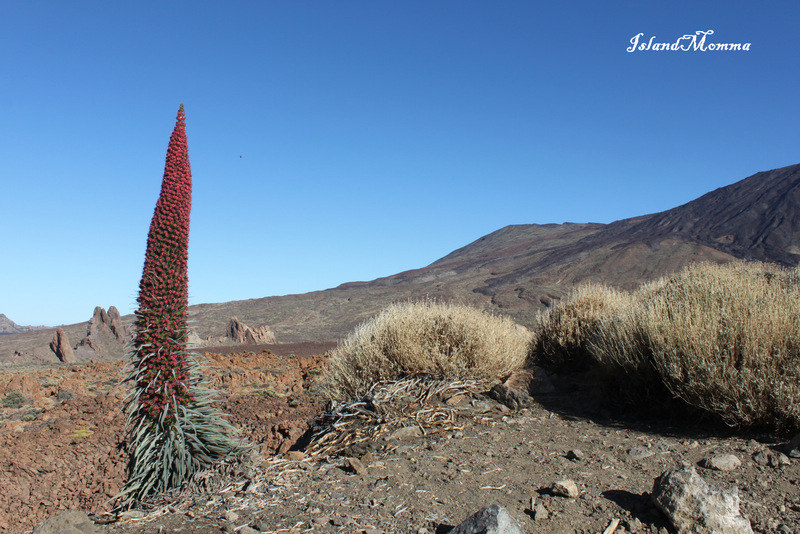 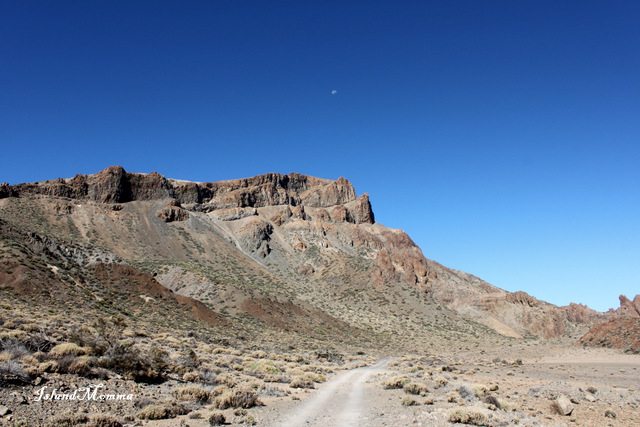 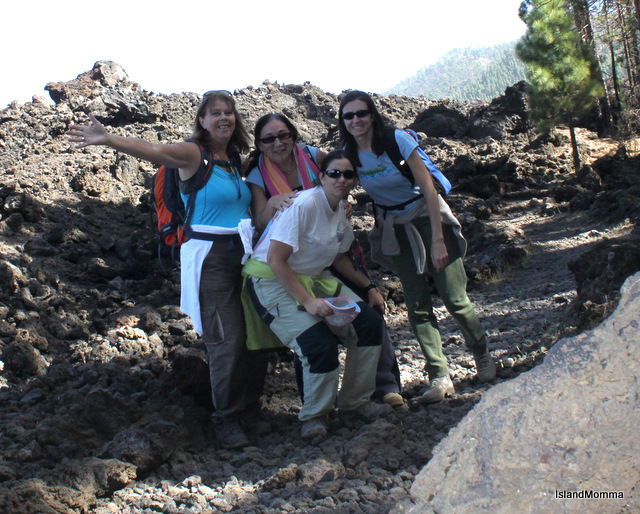 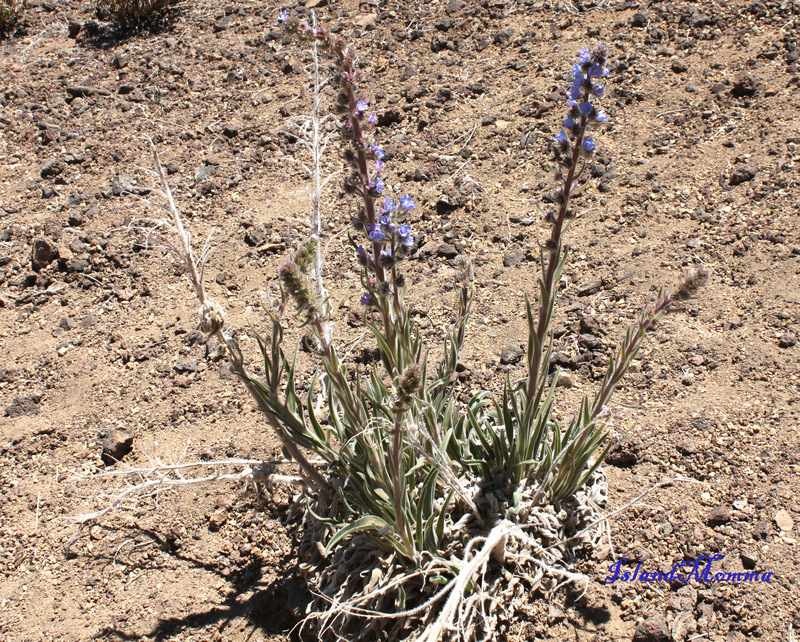 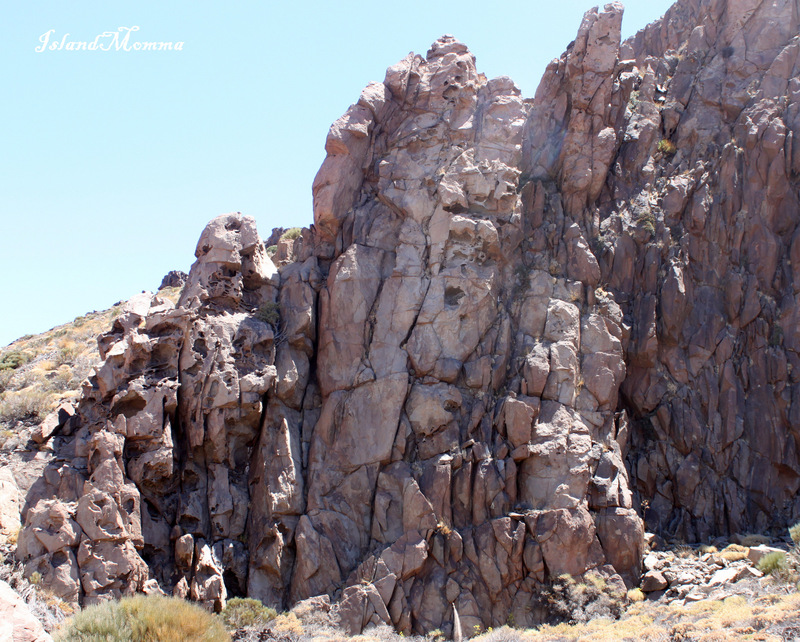 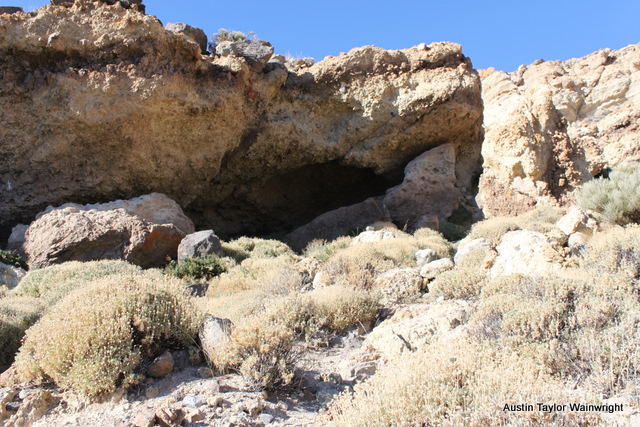 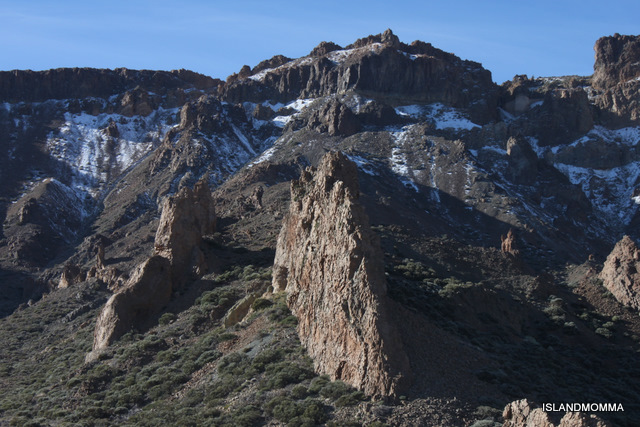 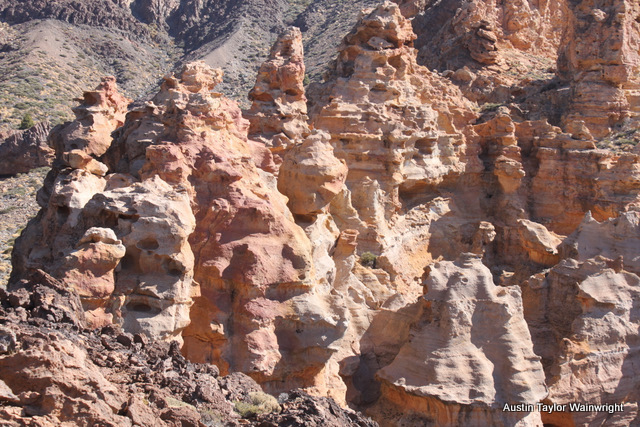 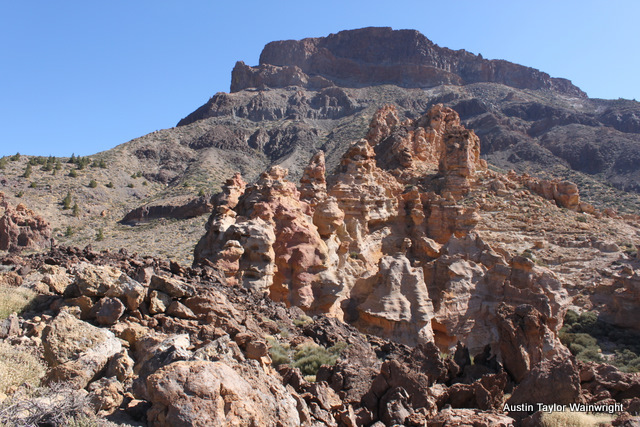 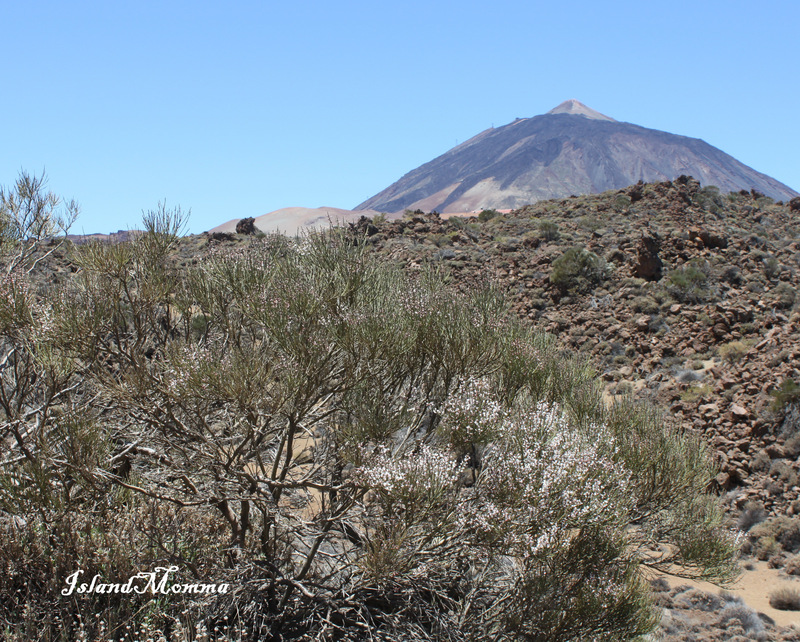 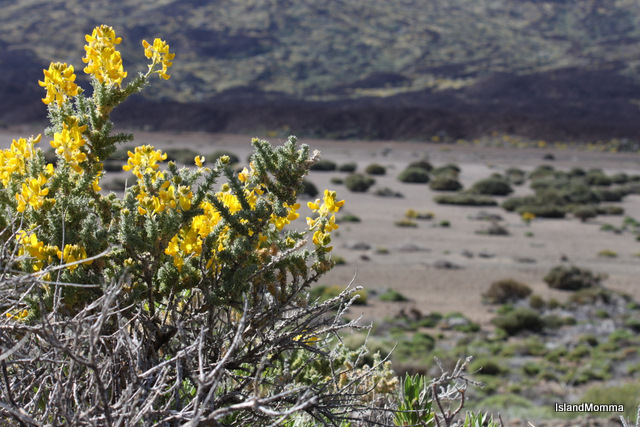 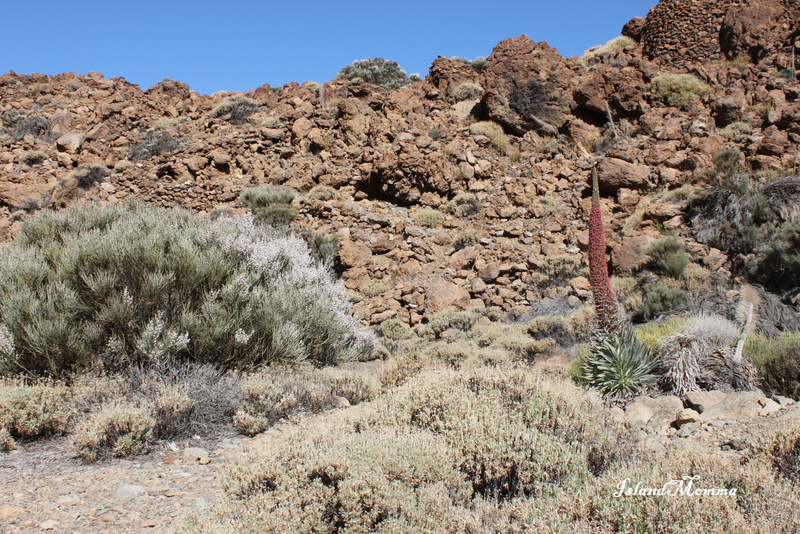 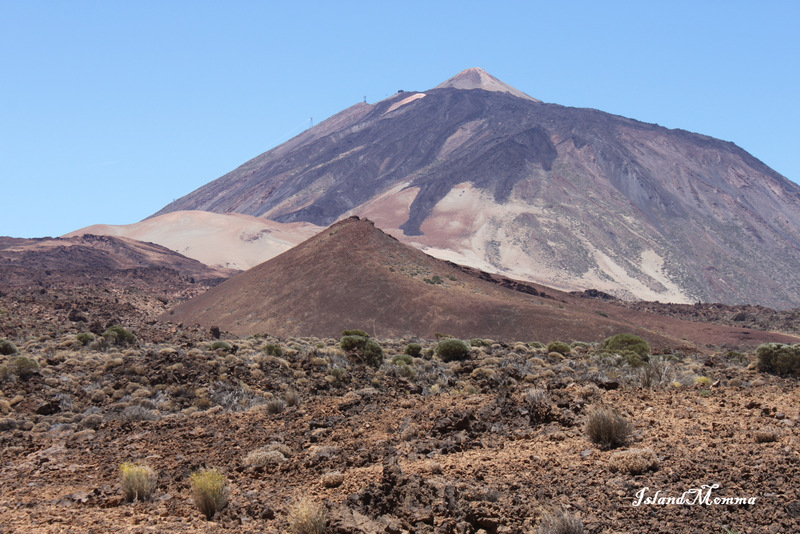 volcanoes, crows, El Teide, lava, parque nacional del teide, pennyroyal, pine forest, poleo, teide national park, tenerife, vilaflor, walking in tenerife | Permalink. 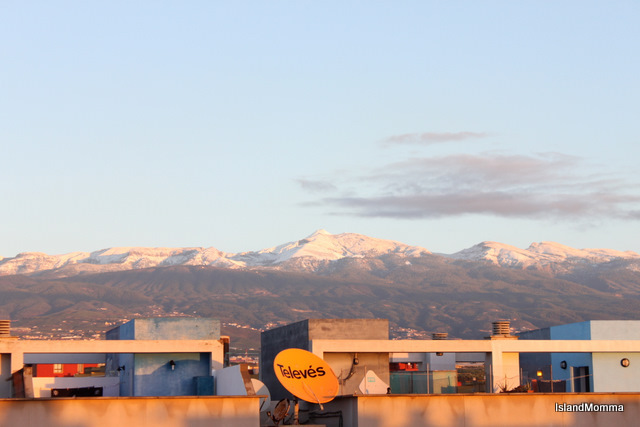 The view from my roof terrace isn’t especially photogenic – at least with the lenses I have, but it does give you an idea of the result of yesterday’s rains on the mountain tops. 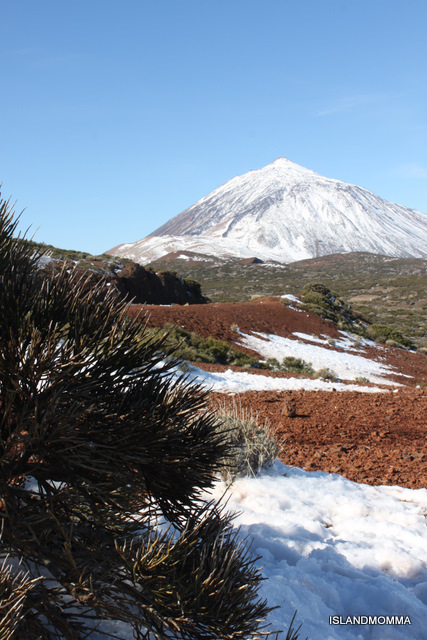 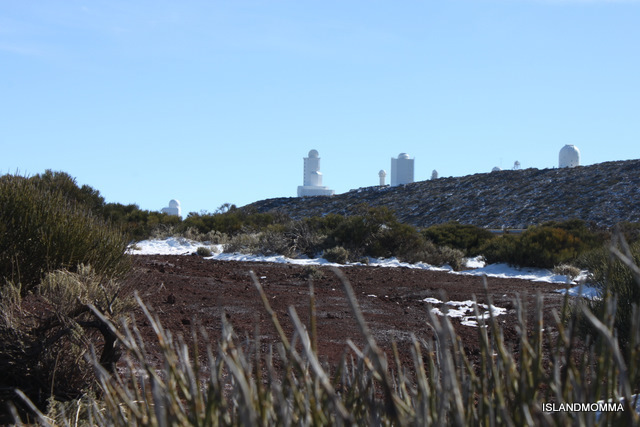 It’s normal for there to be snow on El Teide at this time of year, but not so usual for there to be so much snow on the surrounding peaks. 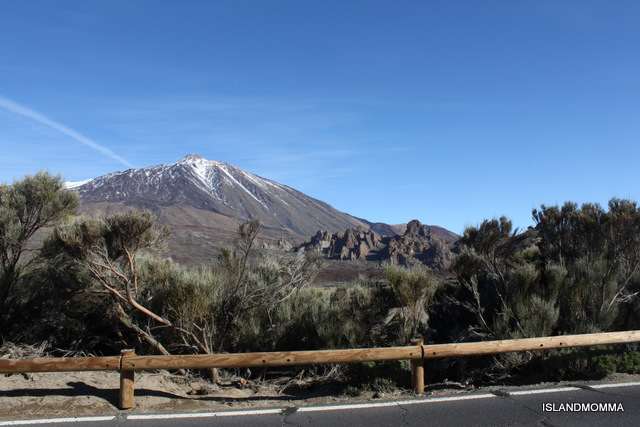 Frustratingly, the roads are closed this morning, so I won’t be rushing up there to get a closer view. 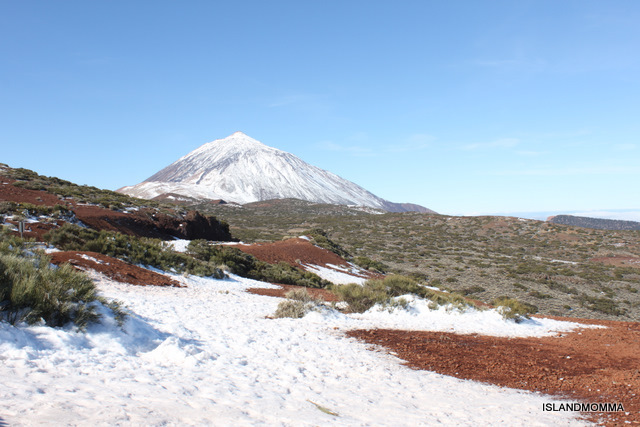 Apparently they are just sheets of ice, which must seem weird to those of you who live where winter snow and sleet are normal, but in this sub-tropical climate I guess there isn’t the equipment to cope with this volume of the white and frozen stuff! 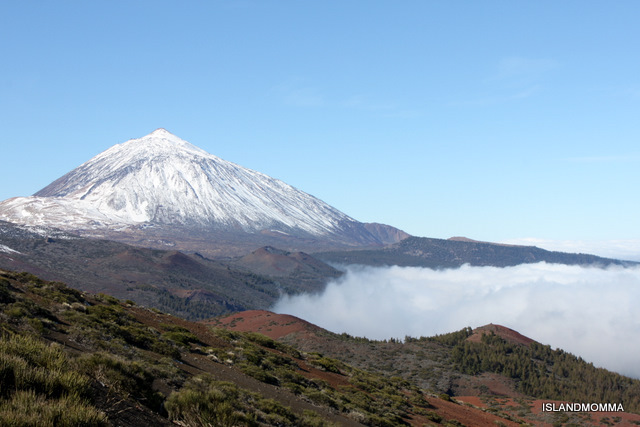 Categories: Uncategorized | Tags: canary islands, El Teide, Islas Canarias, mountains, roof top view, snow, tenerife | Permalink.